v. : ; 27 cm. Vols. for <Feb. 2, 1979>-Jan. 15, 1982 issued by: Export Trade Services Division; Jan. 22, 1982-19 issued by Export Promotion Division; <July 4-10, 1985-> by: Agricultural Information and Marketing Services. Description based on: Feb. 2, 1979; title from caption. if you want to be removed from the ma 1 list. 48201 KANDT FEM. Phone: 231371. Cable: KANDJ DIUBAI. yellow corn. Send telex offers C&F Aqaba. CONTACT: Hasan S. Nabulsi, Pres. 1343, Amman, Jordan. Telex: 21835. Phone: 651"1-6.
transportation and certification of production volume of parent stock required. Campesina, Can, Oficina 422, Bogota, Colombia. Phone: 244-9426. Acid: 1 2%. Offers to be submitted address below latest October 5, 1982. Isued weekly by the Export Promolion Division. Foreign Agricultural Service. U.S. Department of Agriculture. Room 4945 South Building. Washington. D.C. 20250.
urged to contact their Egyptian agents for complete tender documents. Alexandria, Egypt. Phone: 72315. Cable: CHOCOROYAL. powdered milk. Milk must have minimum content of 28% protein and 15% fat. pounds per bag and number of bags per carton. CONTACT: June J. Hsieh, Pres. U.S.A. Telex: 7431893 HSIEH. Phone: (808) 944-9055.
required. Packed in poly-bags, about 25 kgs. to a bag (in bulk), and 1 kg. Pldg., 4-2-6 Hachiman Dori, Chuo Ku, Kobe, Japan. Telex: TOKUMEI J78674. Phone: (078) 221-8181. Cable: TOKUMEI KOBE. 19SO, employs 9; annual sales IM 5.5 million. Quote: CIF German Harbor. Germany. Telex: 851 735. Phone: 2101/23049. South Africa. 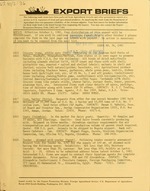 Telex: b24089. Phone: 031/422424. 2,000 tons in November 1982 per regular liner vessels. Offer deadline Sept.
893, Damascus, Syria. Telex: 411009. CACIN C SIMILLAS URIBER, S.A. Phone: 976/22 20 97.
be substantial quantities. Samples and specific information required. Appropriate packaging for retailing. Immediate delivery by surface shipment. Quotations: CIF Tokyo. Bank ref: Fuji Bank, Meidaimae Branch, Tokyo. Japan. Phone: (03) 323-7862. Cable: TSHIOBARA TOKYO. (ATTN: KLINGBERG) or 52-2806 (ATTN: HARATZ). Cabiros S.A., Apartado 405 San Jose, Costa Rica. Telex: 2113 REMARSA. well-maintained on a non-borrowing basis. Send quotation C&F Lagos port. Allen Ave., P.O. Box 3059, Ikeja, Lagos State, Nigeria. 1438 milk, animal feeds, refined vegetable oil, and poultry and farm equipment. b-n\vc iii:intitv of che .rin-' eQunm hase from the IU.S. Reuiicsts connections t"
Street, Boulak, Cairo, Egypt. Phone: "62243, Cable: NORANECANI CAIRO. Auckland. Bank ref: Anz Bank, Shortland St., Auckland, New Zealand. CONTACT: R. Eady, Int'l. Beverages N.Z., 11 High St., Auckland, New Zealand. Telex: BARRY COT 2674 N.Z. Phone: AUCKLAND '33-018. powder. Quantities not determined yet, however, must be substantial. Ltd., c/o Toshin Bldg., 27-25, Yoyogi 4-Chome, Shibuya-Ku, Tokyo, Japan. information required. Appropriate packaging for institutional use. Immediate delivery by surface shipment. Quotations: CIr Tokyo or Yokohama. Limited, No. ", Rokuban-Cho, Chiyoda-Yu, Tokyo, Japan. Telex: GAMA J 23335. Phone: (03) 264-4211. Cable: "GREATMOLUB" TOKYO. Holandesa, S.A., Apartado 32108, Barcelona, Spain. Telex: 52493 PRIN E.
Phone: 93/379 3112. Cable: PHH. Boxes with 20 strip loin, boxes with 8 T-bone, boxes with 18 filets sirloin. Shipment: ASAP. Quote: CIF Vienna. Bank ref: Bank Fuer Tirol U.
A-6380 St. Johann, 05 124 121 Sinna, Austria. Phone: (05 352) 23 160.
consumption, made from soya beans. Represents Burndy Corp., Connecticut. San Salvador, El Salvador, Central America. Phone: 23-7593. Cable; ERNBRAND. of Agriculture, Room 4945/South Building, Washington, D.C. 20250. (1) $50 for a yearly subscription to Export Briefs. leads via direct mail. Unquote. your check or money order should be received by an early date. ;ubscription will be provided, upon request, to foreign buyers and U.S.
information sales and export volume can be omitted in your submission. export products of interest to your firm. lI I I[I I II I I- In"
Service, Room 4945-South, U.S. Department of Agriculture, Washington, D.C.